Swords of Vietnam are a beautiful and interesting cross of Chinese, Japanese, Thai and in later designs, French influences. Vietnamese smiths employed sophisticated methods of inlaying precious metals and excellent chased silver for the fittings of their weapons that are unique to the region. 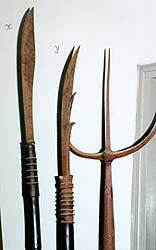 Finer examples of both types of swords are often mounted with ivory elephant handles. These grips are either made of the tip of an tusk elephant or of sections of elephant molars. The kiem is a double edged straight sword that has no parallel elsewhere in Southeast Asia. Kiem are clearly a direct descendant of the Chinese straight sword, or Jian, and mirror their general shape and design very closely. The Vietnamese kiem however are lighter with thin almost needle-like blades. In some respects the Vietnamese straight sword is reminiscent of European small swords and at first glance one might mistakenly assume a European origin for this weapon. The Vietnamese saber, dao, can be found in three varieties. Each originating from one of the three foreign influences mentioned above. From the 1400's to the 1800's, saber forms followed the political divisions of the country. 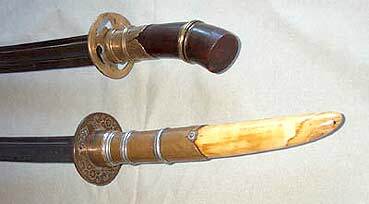 Sabers from northern Vietnam (Tonkin) show a strong Chinese influence. In blade form and design of fittings, they descend from the Ming type LiuYe Dao - 'Willow Leaf Saber'. These dao have a hand or hand and a half grip. Dao of Cochin China are of the two handed variety called dai dao. These are related to other Southeast Asian saber such as the Burmese and Thai dha. But they also show a strong Japanese influence. It is interesting to try and derive from where this Japanese influence derives. There has been a Japanese presence in Thailand and coastal Vietnam beginning in the 15th or 16th century. In Thailand, they served as mercenaries and it is likely that they fell into piracy as they did in other areas of Asia. In their roles as soldiers or brigands, Vietnamese would certainly have come in contact with weapons of Japanese origin. Detail of Tonkin (upper) and Cochin saber hilts. The Japanese influence on Vietnamese dai dao appears strongest in the fittings. These Cochin sabers have guards shaped like the tsuba of Japanese katana. Some are actually copies of tsuba right down to the holes on either side to allow for the utility knives present on the side of Japanese sword scabbards (but are absent on the dai dao). The Cochin dai dao also have a habaki or collar at the forte as do Japanese swords. Sometimes, oval, serrated washers like Jappanese seppa are also positioned between guard and collar. While these specific features are drawn from Japanese sources, the overall design of the Cochin saber is Southeast Asian. Their blades form closely follow the Chinese Willow Leaf pattern mentioned above. And the grips on these weapons are also of round cross-section, like those of Thai and Burmese dha. It should also be noted that the Vietnamese sometimes utilized foreign blades. One example in the Metropolitan Museum of Art's collection in New York has a Japanese blade. Later kiem and dao were also made with French blades. The native forged blades of Vietnam are pattern welded steel. These blades are forged by a Chinese method known as qiangang - 'inserted steel'. This type of blade construction employs an inserted hardened steel cutting edge backed by a soft steel core. These two components are sandwiched in layered damascus steel. 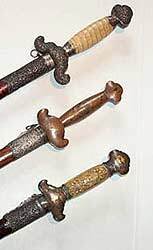 Some examples of parade swords have blades of copper or brass. It is an open question as to why a sword would be made with a non-functional blade. I can only suggest at this time that they were made for use in close proximity to the Annam emperor to prevent their use in an assassination attempt. By the later 1890's, one French traveler noted that the quality of blades had declined. In Vietnamese, the D is pronounced like an English "d". A crossed D is pronounced like "z" in the north, like "y" in the south. In the early nineteenth century another foreign influence affected Vietnamese dao - France. After the French bankrolled the establishment of the Nguyen dynasty in 1802, lion-head pommels began appearing. These sabers are essentially European in design, with 'D' shaded knucklebows. This French pattern is overlaid and decorated in the local Vietnamese fashion, usually with embossed silver fittings on the scabbard and hilt and mother of pearl inlay in lacquer or rose wood scabbards. Other examples have plain tortoise shell covered scabbards. This style of saber has a scabbard chape with an usually sharp upward accelerating curve terminating in a sharp end. This is quite different from sabers of European design which tend to have chapes with rounded ends. This pointed chape is most likely a hold-over from Ming Chinese influences. Vietnam, lying like a dragon along the coast between the Chinese Empire and seafaring nations of Asia and Europe, has been a melting pot of cultures for over millenium. The centuries of development and varying cultural influences combine with excellent local craftsmanship to produce unique swords of great beauty. Today these overlooked treasures waiting to be discovered by collectors and students of antique arms. armed with Kiem, Dao and Daido respectively. Scott M. Rodell is Director of the Great River Taoist Center and owner of Seven Stars Trading Co.. Rodell has over 20 years of experience in Taiji Quan. He is a disciple student of Master Wang Yen-nien of Shanxi province and also studied sword and push hands with T.T. Liang and push hands and sanshou with William C.C. Chen. Rodell has been teaching at Great River branches in Northern Europe since '91 and was awarded 'Honored Judge' rank by the Russia Wushu Federation (their highest rank).He is author of "Taiji Notebook for Martial Artists and "Chinese Swordsmanship in the Yang Family Taiji Jian Tradition" (Fall '01). He is also Moderator of the Chinese Swords & Swordsmanship Discussion Forum at SwordForum.com.